Whether you are a traveler or work in the industry, this hotel checklist is the perfect solution for quality assurance and control when visiting or maintaining a hotel. For hotel managers, this hotel checklist can be distributed to the cleaning staff to ensure they don’t overlook any crucial points and cause guests an inconvenience. This hotel checklist is used by professionals and inspectors as well as reviewers who want to make sure the public and comes in several parts. The hotel checklist is broken up into several parts, audit info, breakfast, health and safety, housekeeping, reception, room by room analysis and action plan. You won’t find a more thorough and easy-to-use hotel checklist anywhere online – particularly one that’s offered for free. Know what you really need to look for when maintaining a hotel, or if you are thinking of breaking into the business, this hotel checklist will provide a quality overview of what it takes to run a hotel smoothly. This hotel checklist spreadsheet is available for free download and ready to use instantly. You can get started on multiple tasks without having to pay for expensive software. 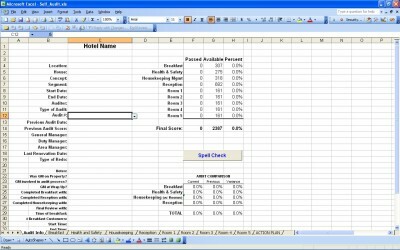 If you have Excel, you can simply download this hotel checklist and get started today. We want to be your source for the highest quality free templates around. Whenever possible, we offer spreadsheets, calculators and templates free of charge. If you enjoy using any of our spreadsheets or templates, please share this page with your friends or coworkers.